A campaign to force Wisconsin Governor Scott Walker into a special election has gathered an estimated million signatures, say state officials. Gov Walker was the focus of protests in 2011 after he and state Republicans curbed public sector unions' rights. He could face the recall election by this summer if the minimum 540,208 signatures are verified. Organisers from United Wisconsin submitted about one million signatures on Tuesday. A recall effort could not be officially filed until Gov Walker served a year in office, which happened earlier this month. The governor's opponents are also angry at the $800m (£521m) in budget cuts to schools passed under him. 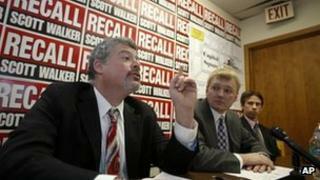 Wisconsin Democrats have no current candidate for the expected recall ballot. Mr Walker already has at least $5m in his election war-chest, with half of that amount coming from out-of-state donors. The governor, who was hosting a fundraiser in New York City on Tuesday, expressed confidence he would survive such a poll. "I look forward to talking to the people of Wisconsin about my continued promises to control government spending, balance the budget and hold the line on taxes," he said in a statement. Gov Walker argued that voters would reward him for balancing a $3.6bn budget shortfall without laying off state employees or raising taxes. State Democratic Party Chairman Mike Tate told AP news agency that given the number of signatures collected, Mr Walker should not try to delay a vote. Mr Tate said he did not expect a recall before May, while Mr Walker himself thinks it will be in June. Gov Walker previously sued the state elections board, and it is now required to carry out a more extensive review of the signatures. Under regular law, the verification effort must be finished in 31 days. But given the huge amount of signatures, state officials are going to request a 60-day period. The state's Republican Party Chairman Brad Courtney said in a statement that a special election would be both baseless and expensive.